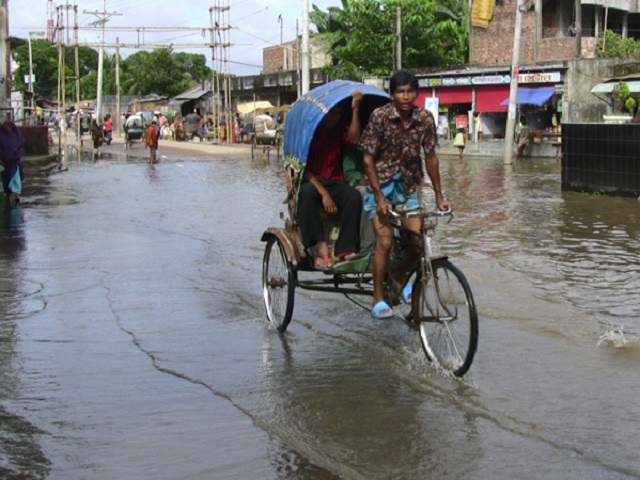 Strengthening resilience in cities like Dhaka, Bangladesh is vital to protecting vulnerable populations from flooding exacerbated by climate change. Photo by Shawn/Flickr. Cities in the 21st century face two monumental shifts: growing urban populations and a rapidly changing climate. As the world’s urban population nears five billion, cities will need to build more infrastructure in the first 30 years of this millennium than they have since the dawn of urbanization. As climate change intensifies, they will need to do this in a manner resilient to storms, flooding, droughts, and rises in sea level. The cities of the near future will need to serve more people than ever before in ways that are more flexible and innovative than ever before. But how can city leaders find novel solutions at such an unprecedented scale? Unlike researchers in a lab, they can’t experiment with many different approaches. New initiatives cost money and impact real people. This leaves planners and decision makers with a dilemma. Should they bound boldly and blindly into unknown territory, or tread more slowly and carefully? At the recent Advancing Climate Resilient Development Symposium hosted by the United States Agency for International Development (USAID), development professionals from around the world spent a morning sharing lessons on urban resilience. Many of these lessons were drawn from pilot projects. A common approach in the international development field, pilots are small, experimental projects that can potentially be expanded to a larger scale. If a pilot succeeds, planners and decision makers can apply this proven strategy to other locations, and if the pilot fails, they can fix or even cancel the project before making too much of an investment. Pilots allow resilience-building institutions to look before they leap, yet many pilots encounter resistance—and with good reason. The large-scale problems facing cities demand large-scale solutions, but often this action never materializes. Without taking time to follow up on lessons learned, even a successful pilot is a waste. Pilots can serve as the bridge between small steps and large ones, but only if they’re done right. So what makes a good pilot, and how can it have a broader influence? The USAID symposium yielded insight into three elements of successful pilots for urban resilience: a flexible methodological approach, customization of that approach to city-specific needs, and integration across sectors. Every good pilot starts with a good idea, and an organized, flexible approach to a problem like climate change can generate a host of good ideas. To that end, USAID created the Climate Resilient Development (CRD) framework, an approach that systematically incorporates climate change into development projects and plans, helping decision makers pinpoint how climate change and other obstacles could threaten their development goals. Approaches like the CRD framework allow city leaders to create customized planning tools for their respective cities. Under the Climate Resilient Infrastructure Services (CRIS) program, USAID and partners have tailored their framework to meet the needs of specific cities in Mozambique, Peru, Vietnam, and the Dominican Republic. In Peru, the city of Piura had a typically arid climate, yet encountered extremely wet years every few decades, with rainfall close to twenty times the regular amount. Climate change is likely to make these intense rainfall episodes more frequent. After floods in a wet year knocked out an important bridge, city officials decided to rebuild with climate resilience in mind. The city government, USAID, and local organizations collaborated to apply the CRD framework to the design new infrastructure that could withstand both wet and dry conditions. In addition to an organized, flexible approach that can be tailored to city circumstances, a good pilot needs to have the right people in the room. Urban planners, architects, engineers, utility companies, and municipal services often work separately from one another, but a complex issue like climate resilience requires them to coordinate. For instance, in the Dominican Republic, city planners designed new neighborhoods in Santo Domingo but failed to coordinate with utilities, leading to the construction of large slums with no piped water. Residents got their water from nearby rivers that were polluted with waste and even human remains. A pilot project under CRIS aimed to correct this lack of cooperation and bring together the many people who build and maintain cities. Due to the experimental nature of pilot projects, they will sometimes fail, but pilots with an organized approach, a tailored plan, and a collaborative atmosphere are more likely to succeed—and when they do succeed, they are easier to replicate. Pilots like this can influence not only their initial organizers but other groups as well, catalyzing a range of related projects around the world. Achieving sustainable urban growth in the midst of climate change will take time and effort, but like any a long journey, it can start with a single step.